Another question that arises in mobile digital news consumption is how often users return to an article – whether to finish reading it, re-read a portion, share it with a friend or for some other reason. This is again especially pertinent for long-form news, which requires more time to complete. Due to the way users are tracked, these metrics are only able to track return visits to articles on the same device as the initial visits – in this case, the same cellphone. Even with this limitation, though, the data do help shed light on how often it occurs and what difference it tends to make in the total engaged time. Long-form readers who return to a long-form article spent about double the time with an article as users overall, 277 seconds compared with 123 seconds.9 This is a bit sharper of an increase than for short-form article returners, though their average engaged time was still nearly twice that of overall users, 110 seconds compared with 57 seconds. 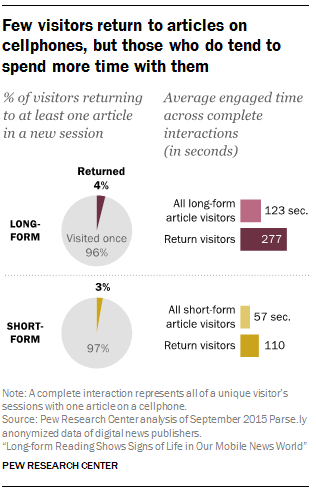 The vast majority of these returns occurred on the same day as the interaction’s first visit: about eight-in-ten long-form and short-form returners (81% of each) came back to an article the same day they first visited it. Another 8% of each returned on the second day and 3% on the third day. One stark difference between returners and overall visitors on cellphones is in the way these different groups of users first land upon an article. 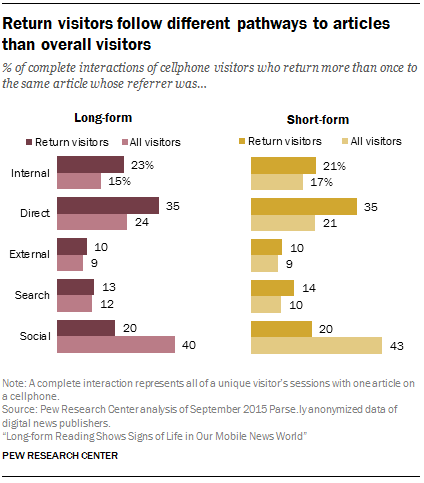 Among both short and long-form return cellphone visitors, the greatest percentage of complete interactions from article returners, 35% each, begin with a user who come through a direct referral. About a quarter (23%) of complete interactions came from return long-form readers who arrived at an article through a link from elsewhere on that site (21% for short-form returners), while another 20% for both types arrived from a social networking site. This is a very different distribution than the complete interactions by visitors overall, who, as discussed earlier in the report, most commonly arrive at both short- and long-form news stories by following a link on a social networking site (roughly four-in-ten of each). And users overall are less likely to arrive at an article directly. This suggests that while social drives much of the overall traffic, these users are less likely to keep an article in mind and develop a recurring interest in it. This may help explain why the average time spent with short-form articles for social media users is lower than for any other pathway, – social networks drive traffic, but don’t necessarily tap into deep-seated interests.